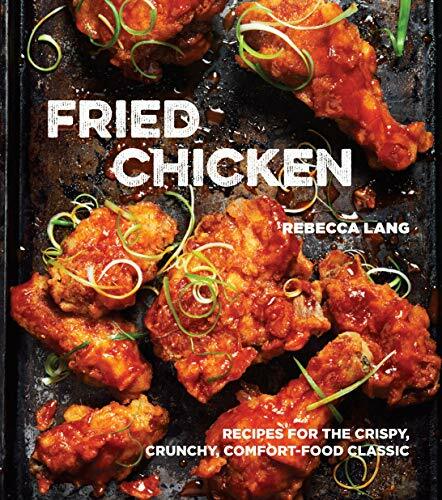 An irresistible cookbook featuring more than 50 family-friendly fried chicken recipes--including classic Southern, globally influenced, and skillet- and deep-fried variations. Fried chicken is comfort food at its finest. Served alongside a biscuit, atop waffles, or just on its own, fried chicken is one of the most universally loved foods around. In Fried Chicken, Southern chef Rebecca Lang collects 50 of the most tantalizing, crowd-pleasing variations on the classic. There are perennial favorites like Buttermilk-Soaked, Bacon-Fried Chicken Smothered in Gravy; Tennessee Hot Chicken; kid-friendly Chicken Fingers; and even Gluten-Free Southern Fried Chicken. Also featured are internationally inspired recipes, such as Saigon Street Wings, Chinese Lollipop Wings, Mexican-Lime Fried Chicken Tacos, and Korean Fried Chicken with Gochujang Sauce. All of these recipes are impeccably tested, foolproof, and will have the whole family singing the praises of perfectly fried poultry. "There is no better guide to take us on this journey of bubbles, sizzles, and perfectly crisped birds than Rebecca Lang. She has tested every recipe with precision and patience, and it shows in every delicious bite: each page of this cookbook brings you a step closer to fried-chicken perfection." REBECCA LANG is a food writer, cooking instructor, television personality, and a ninth-generation Southerner. Born and raised in South Georgia, she is the author of Southern Living's Around the Southern Table, Quick-Fix Southern, Mary Mac's Tea Room, and Southern Entertaining for a New Generation. She has appeared on Fox & Friends Weekend, WGN America's Midday News, and numerous regional and local networks. Rebecca and her cooking have been featured in more than 50 nationally televised Southern Living food segments and in publications such as the Wall Street Journal, the Atlanta Journal-Constitution, the Washington Post, the Houston Chronicle, Wine Enthusiast, FoxNews.com, The Daily Meal, Glamour, and Fitness. She serves as a contributing editor for Southern Living and myrecipes.com, teaches cooking classes across America, and has been the spokesperson for Georgia's official vegetable, Vidalia onions.